In the Infamous series, gameplay revolves around Cole using his acquired lightning abilities to defeat enemies; draining power from various electricity sources in his surroundings to replenish his energy as it runs low. 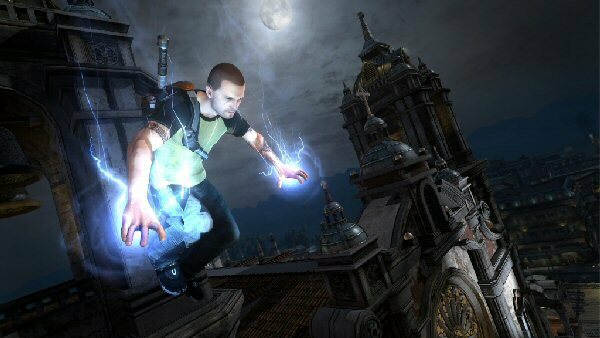 Cole starts out Infamous 2 already in possession of most of his abilities from the first game and new abilities are unlocked as the story progresses. Usually this is done by spending accumulated experience points or by using items called blast cores that he obtains at fixed points in the story. 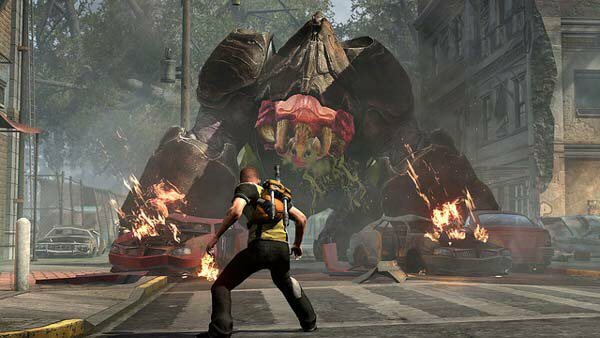 Another way to unlock abilities is based on Infamous 2’s karma system, specifically whether the player chooses to play their Cole as Good or Evil. Karma is affected by the player’s choices in completing either good or evil story missions, side missions, or random events that frequently pop up around New Marais. Different from one another in both physical appearance and lightning color, Good Cole will also acquire abilities that are meant to be precise and cause damage to enemies without harming innocents, while Evil Cole will acquire abilities that cause heavy, widespread damage. Cole will also team up with companions later in the game that, depending on choices the player makes, share either ice-based (for Good Cole) or fire-based (for Evil Cole) abilities with him. Players who are familiar with the first Infamous game will likely notice a big improvement in Cole’s controls and how well he handles in the sequel. The abilities that he retains from the first game have undergone upgrades at the start and can be further upgraded with points later in the game. He handles much more precisely when climbing walls or fighting enemies, yet at the same time he moves faster and more fluidly than he did before. The addition of the Amp, an electric baton weapon that Cole carries around in his backpack, makes a big improvement over the old hand-to-hand melee combat from the previous game. Unlocked abilities are sorted into groups, with each group attached to a button command and a relatively simple menu that lets the player choose which ability from each group they want button mapped for a particular command. The game designers have both increased the fun and decreased the aggravation of controlling Cole, while at the same time they’ve maintained the same basic control scheme and overall feel of the first game. As a game environment, New Marais feels much more alive than Empire City did in the original Infamous. There are marked differences in appearance for each of the different sections of the city and also the surrounding swamplands. The buildings in each section often have unique lighting or architecture and climbing to the top of the tallest building for a look around is often an awe-inspiring sight. The ruined Flood Town section particularly stands out in our post-Katrina collective consciousness and makes a strong impression when you encounter it. Unfortunately one thing that doesn’t make as much of an impression is the soundtrack led by Jim Dooley, especially when compared to Amon Tobin’s exceptional and unique soundtrack from the first game. I wouldn’t say it’s a bad soundtrack by any means, mostly because I love strings and it has a heavy emphasis on them, but more often than not it’s simply an adequate score. There are, however, a few standout tracks worth a listen, such as “Abducted”, “The Flood” and “Get Bertrand”. Even with the improvements made to the gameplay and controls of InFamous 2, I can’t help but feel that it falls short of the original in some ways. The story, while it ties into the first game effectively, lacks its cohesion and doesn’t adequately explain every plot element or engage the player. Cole has been given a new character design and a different voice actor (the latter was apparently changed to resolve production issues), but in both cases I preferred the original. He’s also more of an annoyingly cardboard-cutout hero this time around, particularly when the two female characters (who are at least somewhat interesting on their own) inevitably catfight when paired together in the same scene and he has to step in and calm them down. As a positive, I found myself liking Cole’s friend Zeke much more in this game and the relationship between Cole and Zeke was the most emotionally touching part of the story. Despite having a few flaws, Infamous 2 is a terrific game and a worthy follow-up to the original. I wouldn’t recommend it for everyone (those who disliked the first Infamous game should probably skip it, as it’s very similar in style), but fans of the first game who pick it up will not be disappointed. L.A. Noire’s main protagonist, Cole Phelps, is a returning war hero and newly-minted beat cop in 1947 Los Angeles. By successfully investigating crime scenes and arresting criminals, he eventually becomes a detective and works his way up through the ranks of LAPD’s Traffic, Vice, Arson and Homicide divisions. Cases are rarely as clear-cut as they first appear, however, and simple murder investigations can wind up revealing sweeping conspiracies involving some of the most powerful people in the city. Finding the various newspapers scattered throughout the city reveals a wartime drama that tells us more about Cole’s experiences during the war, experiences which ultimately intersect with his present in shocking ways. 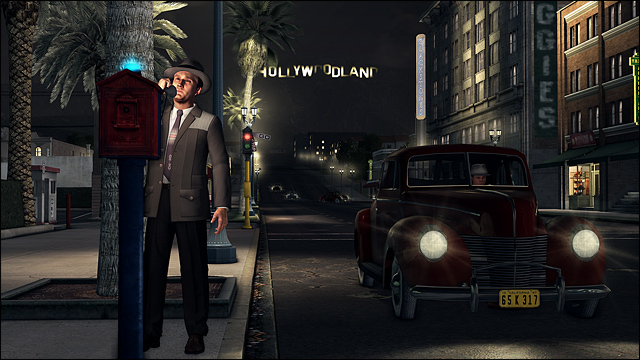 The gameplay in L.A. Noire is divided up into cases that you and your partner will have to work through. Typically you’ll start most cases by being given a quick overview in the police department’s briefing room, then you’ll head out to the crime scene and get to work compiling clues and evidence. Once you arrive on the scene, you’ll need to search both the surrounding area and any bodies that are present and also question any possible witnesses or persons of interest involved with the crime. A word of warning: some of the crime scenes are quite graphic and you probably won’t want to play these sections around children or the squeamish. Uncovering new information from clues or questioning will open up other avenues of investigation and usually result in either apprehending or killing a suspect, usually after a shoot out or car/foot chase. Some cases will involve more than one suspect and you will have to use interrogation techniques and evidence in order to choose which suspect to charge. The driving and shooting parts of the game are done well, but the investigation and interrogation sections are where the game really shines (once you overcome their initial, somewhat frustrating learning curve). Playing L.A. Noire is fairly idiot-proof, because you’ll still be able to complete all of the cases even if you don’t necessarily do so in the best way. There are lots of car chases and shoot outs, but you’ll have the option of bypassing the more challenging action sequences if they continue to give you trouble. You can fast travel to most case destinations by having your partner drive. Although doing so means you’ll miss out on the optional “street” missions that only come in over the police radio while you’re driving. You can free roam anywhere you like on the map and there are hidden cars and gold film reels to hunt down for achievements, but that’s pretty much the extent of the game’s sandbox content. The much-hyped facial motion capture technology used in L.A. Noire is every bit as impressive as it’s supposed to, providing for incredibly realistic performances by the actors. That being said, there is sometimes the slightest bit of deviation between what the actor’s face is doing and what the body is doing for the character. The sound effects and graphics are generally where they should be for this quality of game, although most of the textures look like the sort of thing we’ve seen before from other games. As for the game world itself, the city of LA in huge and feels very much alive around you, although the AI of pedestrians and drivers is a bit quirky and can cause frustration from time to time. 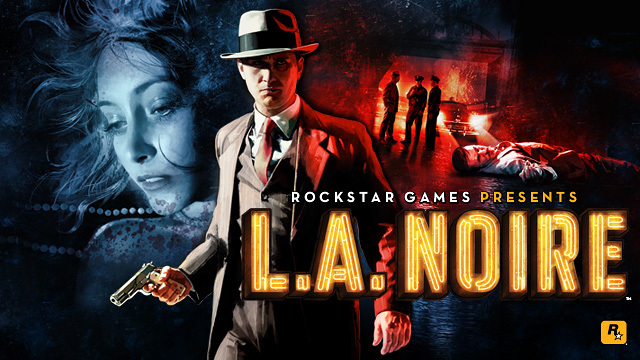 The music for L.A. Noire is a mix of original score, licensed music and original vocal tracks created for the game. The score by Andrew Hale is more cinematic than I typically like game music to be, but works exceptionally well here due to the gameplay and stylistically noir setting. The licensed tracks overheard on the car radio at random while driving around are a great collection of popular tunes from the era, with a mix of stuff that everyone’s heard and more obscure tunes. The original Blue Room vocal tracks (composed by The Real Tuesday Weld and sung by Claudia Brucken of Propaganda) are believably smooth and sultry, if a bit uninspired. There are some aspects of the soundtrack that I like more than others, but generally it’s all solid and terrific work. L.A. Noire is very cinematic in nature, so much so that the experience often feels a lot more like watching a film than playing a game. The quaint glamour of 1947 Los Angeles as it’s portrayed here is charming, but racist and sexist views are also socially acceptable and openly expressed by the characters in a way that’s perhaps true to life; still, they can be a bit cringe-inducing at times. Cole Phelps is an interesting and layered character, though something of an enigma compared to the sort of protagonist I’m used to playing in a game of this nature. Very little information is revealed about Cole’s inner world, home life, or motivations and this makes it challenging to feel a bond with him or care much about how his personal story plays out. Later in the game, I found other characters with more minor roles, such as Jack Kelso and Herschel Biggs, to be more relatable and emotionally engaging. Part action adventure and part murder mystery with a dash of sandbox game thrown in, L.A. Noire has many appealing gameplay elements. I can’t help but feel that there are missing bits of plot here and there, as certain plot points seem to happen out of the blue and the characters will sometimes make references to events that we’re never shown. Nevertheless, the story builds up well over the course of the game and definitely holds your interest until the end. 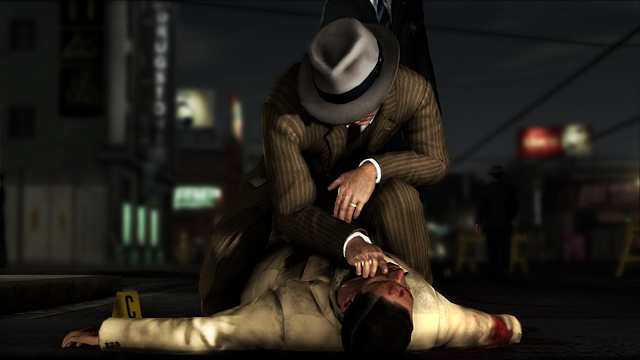 Overall, L.A. Noire is a polished and fun gameplay experience that has a lot more strengths than it does weaknesses. I’d definitely recommend checking it out, if it sounds like the sort of title that catches your interest. My picks for best game music of the year (so far). These are just a few favorites of mine and far from an exhaustive list of all the great game music I’ve heard so far this year. Feel free to pipe in with this year’s game soundtracks that have made an impression on you in the comments. Tips for cohabitating with a non-gamer. The week I first started playing Final Fantasy VII is the same week that I almost lost my PlayStation for good. I was quite taken with the game and set up camp in the living room for a long weekend of marathon playing. At the same time I was so absorbed by it, the various bleeps, blips and button clicks were driving my partner crazy. It wasn’t until he (jokingly?) threatened to kick my PlayStation to the curb that I realized we’d need to come up with some kind of system if I wanted to get my game on and not drive him insane while doing so. In this article, I’ll share some tips from my home which allow time for my gaming while simultaneously keeping the peace. 1) If it’s financially feasible, try to have several gaming options available on multiple platforms. I have consoles hooked up in the living room, several games on the PC in the computer room and a decent collection of portable games for the PSP (PlayStation Portable). With these various options to choose from, I’m usually able to find something suitably entertaining to play without hogging the only television in the house. This is also good for those occasional times when I want to be by myself and do some gaming in solitude. 2) Plan ahead of time and give advance warning for major new releases. If you *know* you’ll be completely hooked on a game and playing it a ton, let your partner know ahead of time. This gives them time to make alternate plans to be elsewhere, should they feel the need to do so. The inverse of that can also be useful in planning your gaming sessions, in that you can take advantage of times when you know your partner will be away for a trip to “geek out” (as I like to refer to it) without getting any static. My partner knows that I like an occasional weekend to myself and will take trips on his own every now and then (in pursuit of his own hobbies) to allow for that time. 3) Try to include your partner in your gaming hobby, if they’re at all interested (without pressuring them, of course). Add some casual games to your library and buy some additional controllers for your consoles. Your partner may not wind up playing Demon’s Souls any time soon, but you can still have lots of fun playing games like Rock Band or Mario Kart together (this is especially true when people are over for a party and a group of you and your friends can all play). I’ve also found that for more cinematic games (for example, Heavy Rain), it’s a lot of fun to play while your partner is watching you and contributing some amusing color commentary. I hope these tips will prove somewhat helpful to you in negotiating the perils of living in a household with a non-gamer. The basis for all of them is mutual respect for one another’s feelings and allowing for space when it’s needed. Thanks for reading and happy gaming! I’ve been a gamer since I could walk and talk, but when I was little I never thought of myself as a “girl gamer” at all. I remember sitting with my dad in front of his ancient computer and gleefully watching him load some D&D-type game from a tape recorder (!) while he tried to explain the controls to me. We played that game and many others together in those early years of my life, when I would visit him during the summers. It wasn’t long before the games started getting more complicated and I started showing the controls to him instead, as he got more involved with work and had less time to game. Eventually it became something I would do on my own instead of with him, but those formative memories of bonding with my Dad via gaming together have always remained with me. I suppose I was about 9 or 10 when I got my Nintendo Entertainment System for Christmas a few years later. I’m sure I must have whined to my mom about how much I wanted one for months beforehand. She didn’t really understand my love of games, but she indulged me nevertheless and I am sincerely glad that Youtube did not exist back in those days to memorialize my reaction. However, it wasn’t long before she was after me to stop running around like a tomboy, put those games down and be more “ladylike”. My girl friends were fun enough to do “girlie things” with, but they didn’t know Mario from Zelda. I got along fine with most of the boys I gamed with, but I also recall losing many a friendship because I wouldn’t let a boy turn his friend, who just happened to be a girl, into his girlfriend. These were just some of the ways that I found myself to be considered a girl gamer by others, whether I wanted to be or not. Being the stubborn sort (and I think it takes a bit of stubbornness to be a girl gamer, when the world may tell you in so many ways that it’s not for you), I continued to be an avid gamer over the years. I started to pay more attention to the differences between how male and female characters were portrayed in the story. These differences became even more sharply outlined as overall quality improved in the industry and game characters grew more faceted and complex. Historically (with a few rare exceptions), there hasn’t been a whole lot of room for women in games beyond the dainty flower to be rescued or later, the hyper-sexualized eye candy to be ogled. Trying to talk about how much this frankly sucked with other male gamers was typically met with dismissal or annoyance (and this lack of empathy between male and female gamers hasn’t improved as much over the years as the pretty graphics have, unfortunately). The role of female characters in games has slowly but surely been improving, with many impressive strides made in recent years that I’ve been thrilled to see happening. However, there is still quite a way to go in resolving what is still an unbalanced and frequently sexist mode of objectifying and marginalizing female characters in games. I’m a gamer (and not just a girl gamer) because I have a genuine and lifelong love for games that doesn’t need a qualifier stuck in front to it to be validated. I’m a girl gamer (and not just a gamer) because there are still many issues with how female gamers are treated, representation of females in the gaming industry and with portrayals of female characters in games. Girl gamers are a valid part of the gaming public that deserve to have their concerns and input about these issues recognized.